ABC time! FREE seller's kit with graphics includes just about everything you need to create your educational products! This SELLER'S KIT includes task card template, frames, border, banner, shape frame and digital paper! You will LOVE the adorable and fun plastic letters. Add these graphics to your classroom materials and TpT items! These graphics are just what you need for your classroom and educational products. You will LOVE these ** 10 ** graphics that are so much FUN! 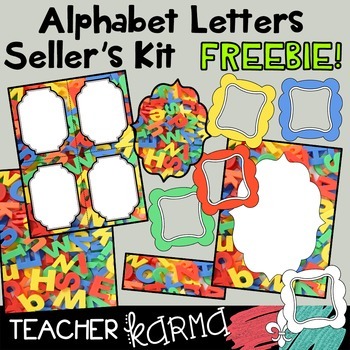 They are absolutely perfect for adding to YOUR TPT EDUCATIONAL PRODUCTS, parent newsletters, literacy and writing stations, activities, printables and student worksheets, class invitations, etc. *There are 10 great graphics included in this download. Each png graphic was created at 300 dpi.